What is a Sneak Peek Trunk Show? 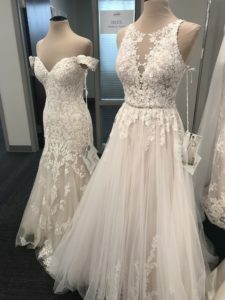 Our designer, Essense of Australia, will be sending us not-yet-released dresses for our brides to try on and buy before they get debuted to bridal boutiques in the Fall. When is this awesome event? So, you’re saying One Fine Day Brides will get to see these dresses before bridal boutiques do? Yes!! This is what is so exciting about this event! You will be able to buy a wedding dress that won’t be in stores until early 2019. Talk about being ahead of the curve and looking completely different from all other weddings! Okay, what gives? This sounds amazing! Right?! There is nothing too different about this weekend than any other weekend here at the boutique except THAT YOU GET TO SEE WEDDING DRESSES BEFORE ANY ONE ELSE IN THE COUNTRY DOES! Sorry for the caps, I am just super excited for this event. What do I need to know before making my appointment for this event? Because these are dresses that are not (for a certainty) part of the final collection shown in the Fall, the style you fall in love with during your appointment, might not be available to purchase later that same week so you really have to come to your appointment prepared to say yes if you fall in love with a dress. Also because of the nature of this event, your wedding has to be December 2019 or after. If your wedding is before this we would love to have you in, we might just ask if you have another weekend available! Lastly, pictures will not be allowed. We want to honor the designer’s creative privacy and as such pictures won’t be allowed during this event. I’m totally in, how do I make my appointment? Yay! Call us at (260) 483-8000, email Amy at info@onefinedaybridalandgown.com or visit our Contact page to make your appointment! We hope you’ll join us and be sure to make your appointment ASAP!